This weekend the local HMGS-South group played a game of Ironclads, using the board game rules with some adjustments to accommodate miniatures larger that the game’s one-hex ship counters. The scenario was to be loosely based on the CSS Arkansas attacking the Union fleet at Baton Rouge in August of 1862. 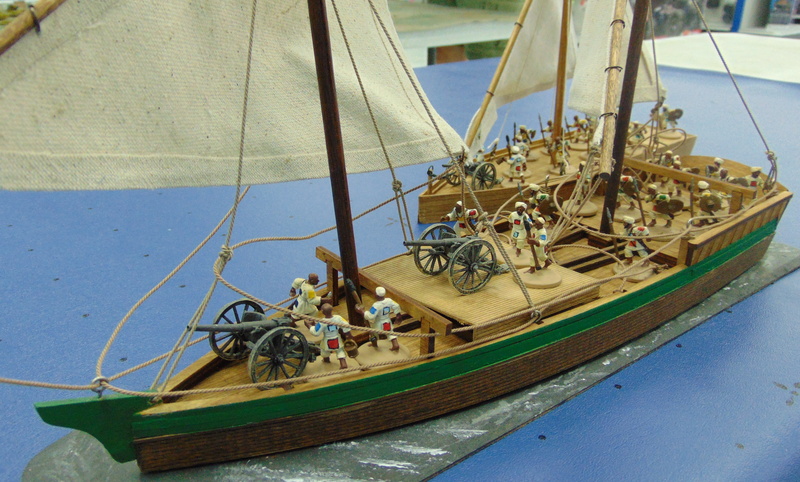 The large number of players that showed up required some non-historical ship additions . The ships were 1/600 scale models from Thoroughbred. Initial setup with a lone Union picket watching the channel. Signaling errors result in an early collision in the Confederate fleet. The Union picket ship, under fire from the Confederate fleet, maneuvers out of the way. Collisions are narrowly avoided in mid channel. The Union picket is on fire and will eventually be abandoned. The Manassas has maneuvered for a ram attack but suffers a rudder hit just short of the enemy. The Arkansas runs through the Union fleet. A Confederate sidewheeler’s boilers explode as she burns. The Charleston rams a Union river ironclad.